When you walk into Aspetto, you’ll be transported back to a time that you’ve long forgotten. A time when gentlemen shook your hand, learned your name, and looked you in the eye. From the warm light that streams in through the windows, to the wingback, tufted leather chair, you’ll wish you had a glass of scotch in one hand and an expensive stogie in the other. The whole environment evokes names like Connery and Sinatra. 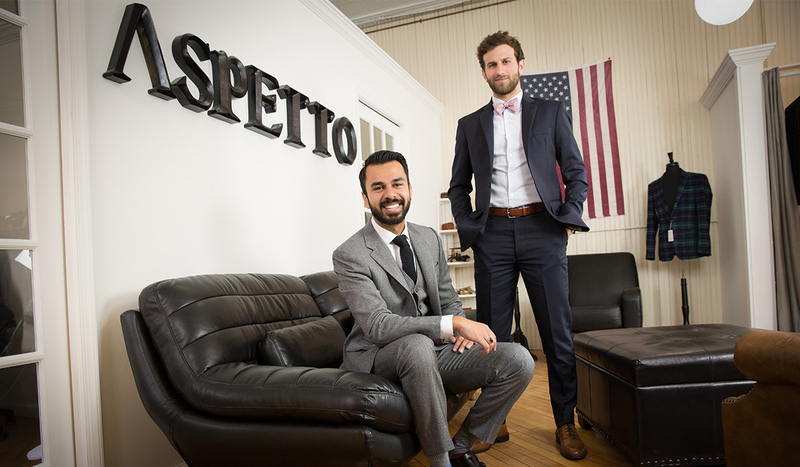 Aspetto, meaning “appearance” or “looks” in Italian, is also the name of a Fredericksburg, VA bespoke that sells America’s first bullet-proof suit (ok, it’s actually bullet-resistant, but we can all agree that those are practically the same thing). In fact, the IIIA certified ballistic material used in Aspetto custom designs surpasses the standards of the National Institute of Justice (NIJ). It’s the lightest material on the market that performs at such a high level, which explains why Aspetto serves the Department of State, the Pentagon, Washington Metro Area Transit, the US Army, Veterans Affairs Special Agents ... and those are just the ones they’re allowed to tell us about. These guys can make just about anything bullet-resistant: from boxers to backpacks, custom tuxedos to thobes, there are very few things Aspetto hasn’t developed. And the story of how it got started is even more interesting. Canvassed Jacket: A layer of horsehair canvas underneath the wool fabric shell that helps the suit jacket keep its shape. Rarely found in modern suits; always found in Aspetto’s custom-made suits. 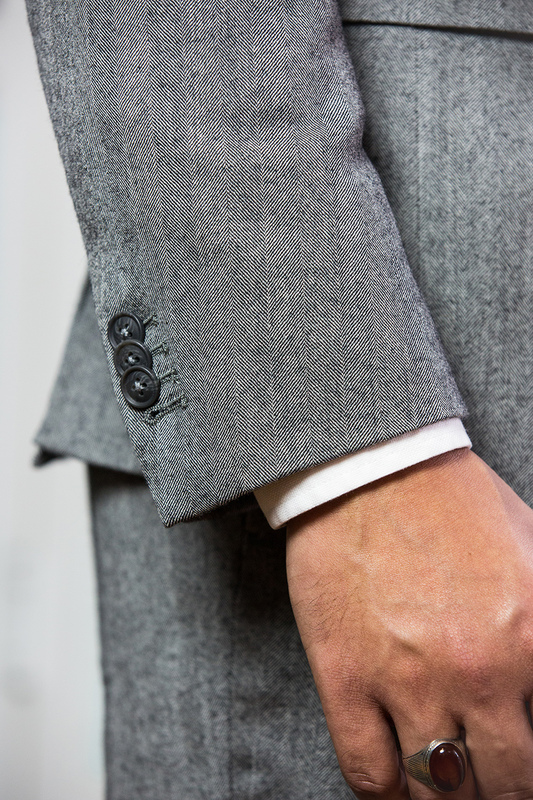 Fused Jacket: A fusible interlining that’s glued to the wool shell of the suit jacket. Always found in off-the-rack suits; never found in Aspetto’s custom-made suits. Abbas contributes some of their success to naive dreaming. “You have to believe that what you’re working on is going to be successful,” says Abbas. Along with the enthusiasm to believe in future success, Abbas and Robert worked hard to understand their competitors. At the time, there was no one else in America combining ballistics with clothing. On top of that, they only had one international competitor named Miguel Caballero: “The Armani of bullet-resistant clothing,” says Abbas. It was clear to them early on that this was a great idea; they were in conversations with NCIS even before their project was presented in class. Robert’s post-college plan had always been law school. But as they worked through this project and ended up building a real company, he knew he wanted to stick around. “We were both about to graduate college. No better time to take something on like this,” says Robert. Enter into our James Bond Makeover Giveaway, and turn your man into a bullet-proof stud. “For the first couple years, we were only paying ourselves about 500 bucks every two weeks,” laughs Abbas. “There was a lot of sweat equity,” chimes in Robert. As anyone who has worked for themselves can relate to, starting a business—even a successful one—is no luxurious task. As the business’ founder, Abbas admits to being unorganized. “He’s very organized,” says Abbas as he points to Robert. “You know you want to work with someone whose strengths are your weaknesses.” Initially they both went headfirst into every project, but they quickly learned to take on the roles that matched their personalities. “After working together and seeing the drive that Abbas had,” says Robert, “that was exciting.” Abbas focuses on sales and Robert takes care of the logistics. A true sign of success are the stories of their clothes in action. Just last year, a State Department agent was shot in Guatemala but remained unharmed because he was wearing the Aspetto ballistic t-shirt. 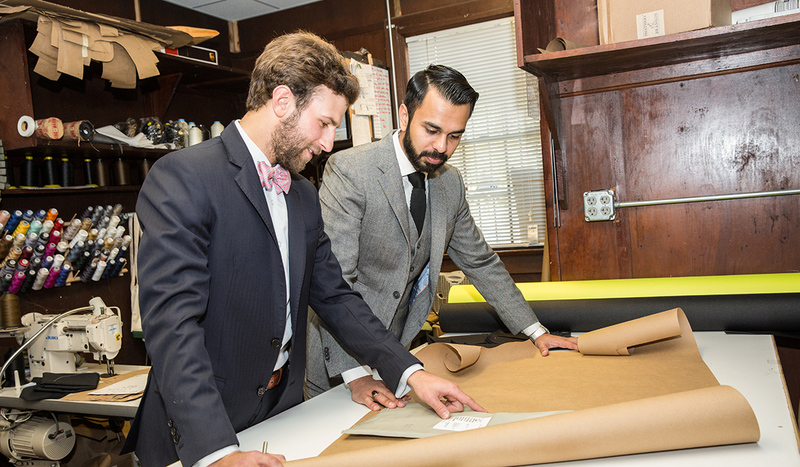 Developing custom clothing with over 2,000 high-end fabrics, Robert, Abbas, and their team—consisting of Noel McPherson, Maribel Cano, Alex Gonzales, and their intern, Quentin—are ready for an order of just about any size. It’s Not Just Ballistics. It’s Bespoke. As a true bespoke (the proper old-school term for made-to-order goods), Aspetto provides custom-designed, hand-made menswear and women’s wear. They serve celebrities and special agents along with the everyday Joe that’s working with a budget. As soon as you step foot through the door, you’ll have the full attention of a fashion-consultant, someone who understands the nuances of a well-made suit. Even better? You don’t have to spend more if you don’t want to. “A gentleman came in just last week with a small budget,” says Robert, “and he left with hand-made, custom shirts that he really liked.” But if you’re looking for ballistic menswear, be ready for your background check. Aspetto performs a thorough background check before selling any ballistics clothing, since the mob isn’t their target market. What’s the difference with Aspetto? It’s class. It’s the experience. It’s the suit you get to build from the ground up. “When we order fabrics, we only order what each customer chooses in just the right amount for their suit. It’s truly custom from the very beginning,” says Robert. If you’re looking for something quick, Aspetto still carries off the rack suits and rentals. But your experience will far exceed that of a commercial suit shop. So go ahead and stop by their Caroline St. store. We promise you’ll feel like James Bond no matter what you end up buying.